Pirates ’04 UD Etchings Auto Contest! 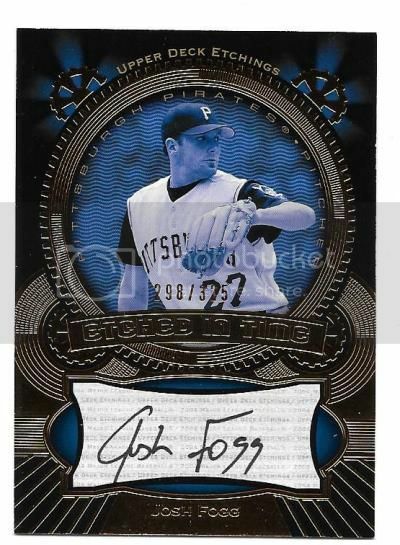 This contest is for a Josh Fogg 2004 Upper Deck Etchings – Etched In Time Auto #’ed/325. Good luck!!! This contest will end Friday, January 6, 2017 @ 8:00 p.m. EST. To be honest, I think that I have a much better idea what is happening in college football than most of those that vote in the polls. This is my top-25. Feel free to comment below with your thoughts on how dumb I am. NOTE: This is a top-25 poll. It is who I think is best at this time. No projection. No prediction on who will make the college football playoff. 2.) Clemson – After Alabama, there is no clear-cut order of teams. I don’t like the narrative that Clemson “finds a way to win” over lesser opponents. My ranking of them at number two is as much an indictment of other teams as much as anything else. I would not be shocked to see them lose one of their next three games (Florida State, Syracuse, Pitt). 3.) Michigan – Most of their wins are against “garbage” teams. Wins over Colorado and Wisconsin are enough to justify this spot, in spite of an otherwise weak schedule. 4.) Washington – Many were singing the Huskies’ praises before the season started. I didn’t buy it. After dismantling Stanford and Oregon, I have to buy in for now. The Huskies should finish the season with no more than two losses. The two losses may come in the next three games against Utah, Cal and USC. 5.) Ohio State – Regardless of the loss at Penn State, I would take the Buckeyes to defeat any of the teams that I have ranked below them. I’d probably take them to beat three of the teams I have ranked ahead of them. So, there’s that. 6.) Auburn – Go ahead. Tell me I’m wrong. I don’t care. Right now I would take Auburn to defeat both teams (Clemson and Texas A&M) that have beaten them. Rhett Lashlee has the offense clicking. The defense allows just 14.1 points a game and other than A&M’s 20 points again, the most scored on them was Clemson’s 19. The Iron Bowl is going to be a battle this season. 8) Nebraska – This ranking is probably a stretch. They are undefeated but nothing there screams “Wow, these boys are good!” I see Wisconsin easily handling the Cornhuskers on Saturday. 9.) West Virginia – The only team that plays quality defense in the Big 12. Consecutive impressive showings against Texas Tech and TCU have me believing much more in this team than I did two weeks ago. I don’t know what it is, but there’s an uneasy feeling I have about the team. Currently, they should likely be favorites in all games the rest of the season with the exception of Oklahoma. However, the Sooners gave up 59 last night to a Texas Tech squad that WVU held to 17. 10.) Oklahoma – The Sooners have two losses, but both were out of conference and the Sooners have as good of a shot at running the table as West Virginia or Baylor. 11.) Baylor – They are undefeated but I am far from impressed with their wins over Oklahoma State and Iowa State. If they suffer any significant injuries, it could all fall apart for the Bears. 12.) Louisville – I don’t know that they lose another regular season game. An out-of-conference contest with Houston is the toughest challenge remaining. I’m just not buying all the hype. It never takes long in the college football world. Last week a picture surfaced via social media of an LSU airplane at the Morgantown airport. Fans will be fans and things were heard from Les Miles visiting WVU to LSU courting Dana Holgorsen. The first obviously makes no sense, but what does out of the maniacal college football fan base? “ 1. Baylor — Get him an offensive coordinator who can keep up with Big 12 and he’s set. Think of a possible “trade” that winds up with Briles going to LSU. West Virginia— The school seemingly doesn’t want Dana Holgorsen there. Holgorsen may not want to be there. You think Les Miles wouldn’t upgrade recruiting? Les Miles is a good coach, let’s not kid ourselves. Prior to struggles over the last couple of seasons, Miles was considered one of the top coaches in the nation. Many still hold the “Mad Hatter” in that regard. He’s great for a sound bite. We would be a great ambassador for West Virginia University. He seems like a nice enough guy. However, would it even be a fit for WVU? His inability to adapt his offense is what ultimately cost him and Cam Cameron their jobs. Mountaineer fans have been there and done that. Third and long, Don Nehlen runs the draw. Rich Rodriguez showed an inability to adjust in-game if his system wasn’t working (see: Backyard Brawl 2007). Bill Stewart…all I need to say is Jeff Mullen. Dana Holgorsen has also shown an inability to adjust during games that his offense just isn’t clicking. What makes us believe the fifth time would be the charm? This is the Big XII. A team must score, and score a lot. Miles attempted to fit round pegs into square holes at many positions, including quarterback. During the height of Miles’ success at LSU he had some of the best defensive lines in the country. That has been lacking recently. Looking at all WVU head coaching hires back to Nehlen, there was an element of the unknown. The men had not been head coaches at the highest level of college football. Maybe they could make it happen. We have seen Les Miles coach at the highest levels and even win the National Championship in 2007. We know what he is. However this is a “what have you done lately?” business (see also: Charlie Strong, James Franklin) and recently we have seen what Les Miles may no longer be. Is this a route that WVU and its fans want to go? The college football season is only five weeks old, but that means it is also a third of the way to the end. I do not anticipate that the 4-0 WVU team is going to complete for a spot in the College Football Playoff, but the record means there is a chance. A 12-0 Mountaineer team would likely get in, but it is always nice to have some help. Despite the team not playing this week, there are plenty of games across the college landscape that could factor into being chosen for the playoff or not. Once disposing of an opponent you have to wish them nothing but the best. If they win out, they move up the polls and make your victory look that much better. This is truer yet with non-conference opponents. Those would be easy selections for me on a week-by-week basis. I will not take the easy route. The season-opening win over Missouri has lost luster with the Tigers now 2-3. They still have Florida, Tennessee and Arkansas on the schedule. If somehow they ran the table the win looks that much better. BYU also is just 2-3, but as an Independent, they are not locked into a conference schedule. The next three weeks they play at Michigan State, host Mississippi State and play at Boise State. Running those games or even going 2-1 would be an advantage for WVU. This appears unlikely, with the Cougars’ two wins (over Arizona and Toledo) coming by a combined four points, but the game is played on the field. Mountaineer fans, you want these two teams to win. Every week. While just 2-2, both of Oklahoma’s losses have come against Top 6 teams (Ohio State and Houston). On name brand alone the Sooners will get the benefit of the doubt in polls and get ranked higher than may be deserved. An 8-2 Oklahoma team invading Morgantown in November will likely be a Top 10 team and should the Mountaineers win, giving them a quality victory. A win by 2-2 Texas only hurts WVU. It bumps Oklahoma out of the Top 25. Texas’ wins are against an over-ranked (shocking, I know) Notre Dame team and UTEP. It’s conceivable that the Longhorns end the season at or below .500. Knocking off Oklahoma (or Baylor) is no good as far as WVU fans should be concerned. With a win over Oklahoma already under their belt and a showdown with Louisville late in the season, Houston is what Tim Brando refers to as a “fly in the ointment.” They are a serious threat to steal a spot at the playoff table from one of the Power Five conferences. To this point in the season the Big 12 appears to be the odd man out and if two conferences fail to get in, there’s little chance for the Big 12. I do not see the Midshipmen pulling the upset, but they are one of the better teams left on Houston’s schedule. Navy is always a threat, especially if a defense does not play assignment football. The result of the game itself should not be as important as how the game plays out. For WVU fans, it’s the team you just defeated against the team you play next. The Red Raiders average 59.5 points a game this season, with a low output of 55. The Mountaineers were only able to score 17 on the Wildcats. If Tech goes into Manhattan and puts 45 points on the board, is that an omen for the Mountaineers’ trip to Lubbock? WVU should be able to put up a season-to-date high in points against the Raider defense. Will it be enough? If you love the Mountaineers, or any team, then you have to follow ALL of college football. There is no sport that has as many moving parts affecting the ultimate champion. I preface this piece by saying that I did not see one play of this game. I did listen to the WVU Radio broadcast for most of the second half. The Mountaineers have had a history of disappointing in week one, going back to the Kickoff Classic against Nebraska in 1994. The Mountaineers were embarrassed on national television, losing 31-0. It may be that I did not see the game. It may be that the Mountaineers just had a solid performance. It’s likely a combination of both. I’ve been told that I’m too negative and pessimistic about the Mountaineers. However, I don’t know of too much to pick at in today’s performance. The positive certainly outweighs the negative. Losing the turnover battle 3-1 is concerning. Head Coach Dana Holgorsen sounded dismissive of the turnovers in his quick on-field interview after the game and doesn’t appear concerned publicly. Losing the turnover battle will lead to losses. That is basic football math. Settling for four field goals is concerning. It was a problem that plagued the Mountaineers at times last season. Thankfully Mike Molina was perfect today. The defense gave up 26 first downs (and the offense had just 24) and 462 total yards. Both numbers are higher than I’d like to see, but not alarmingly high. It was a bend-but-don’t-break performance, as they did hold the Tigers to just 11 points. There was plenty to like and be optimistic about. Missouri only allowed 16.2 PPG (6th nationally) and 302 YPG (9th nationally last season). Only twice last season (against Mississippi State and Arkansas) did the Tigers allow more than the 26 points that the Mountaineers scored today. This is also a defense that has six of their front seven back and eight starters total on defense. Over the last couple of seasons, I have been quite critical of Skyler Howard and his throwing, specifically his completion percentage. It is a justified criticism, based off his 54.8 completion percentage in 2015. Today he completed 65.7% of his passes. In 2015 he only passed for more than today’s 253 six times. He also had six games under 188 yards last season. As mentioned earlier, Mike Molina was perfect today on his six kicks (4 field goals, 2 points after). Many teams struggle to find one good kicker. It’s a small sample size, but it appears that the Mountaineers may have two. One last thing that I am happy to see is somewhat WVU related, but also not entirely. Listening to the broadcast, it was nice to hear multiple players’ names that are from the state of West Virginia. Many have criticized the program for “not keeping players in-state,” but there haven’t many FBS-bound players from the state. It appears that West Virginia high school football is making progress. For those of us that at times miss “the good ol’ days,” this is nice to see. Personally, I hope the trend continues. He played at WVU from 1983-86, averaging 12.3 points a game in his career. His 1.520 points are currently 18th in West Virginia history. Following a senior year in which he averaged 17 points, he was drafted in the fourth round by the Los Angeles Lakers. He was inducted into the WVU Sports Hall of Fame in 2013. He never played in the NBA but made his name in racing. Blaney won 11 times in the World of Outlaw Series and as of mid-January, has 127 career victories in the Arctic Cat All Star Circuit of Champions and won that series title six times. His New Year’s Day win gave him a victory in each of his 27 years of racing. Despite becoming a racer and not staying in basketball, Blaney still follows Mountaineer basketball. His twitter page has plenty of WVU Basketball retweets. For just a moment, I thought Al Davis was still alive. After last week’s article, there was a “Just win, Baby!” comment or something like that. Well, we see how that worked out. Perhaps the assumption was that WVU was going to roll through the Big 12 unscathed. You know what happens when you assume. You’re usually wrong. After one month of this season, it appears that we could be looking at another season like 2007. After the 13th week of that season, WVU sat at #2 in the country with one loss on their record. LSU ultimately won the national title with two losses. There were no dominant teams that season. There were a bunch of good ones, but they all had weaknesses. That’s how I see this season at this moment in time. One week ago, many were down on Alabama after their week 3 loss to Mississippi. They lost by six points in a game where they committed five turnovers. However, after their annihilation of Georgia, they are back in the discussion as one of the best teams in the country. If WVU doesn’t turn the ball over against Oklahoma, it could have been an entirely different game. All they can do is fix it and move forward. While I don’t include WVU’s games in these pieces, they still need to take care of their own business. Unfortunately, they didn’t last week. You can’t count the Mountaineers out of a playoff berth yet. There is still plenty of football to be played. The loss to Oklahoma combined with the devastating loss of Karl Joseph this week means that it’s going to be a tough row to hoe. On the bright side, two of the desired outcomes from last week came to fruition. North Carolina defeated Georgia Tech and Clemson beat Notre Dame. WVU needs chaos and now I give you five games that the chaos would be desirable in. WHY: Clemson did most everyone in the country a favor last week by knocking off Notre Dame. One more loss by the Irish and they are unlikely to sit once the music stops in this game of musical chairs. Georgia Tech has been one of the bigger disappointments nationally in the 2015 football season, but they can’t be overlooked. Running the triple option, the Yellow Jackets are always a threat to upset due to the difficulty of defending them. The game is typically a difficult one for Clemson, whether favored or not. Tech has won five of the eight games since 2007, including a 28-6 win last season. Clemson is one of the ACC’s limited shots at the playoff and even one loss in this weak conference could be fatal. WHY: Anyone that denies that the Crimson Tide are a blue blood that receives the benefit of a doubt either doesn’t know college football or is an Alabama fan. Or both. A second loss for Alabama would have them already teetering on the edge of missing the playoff. If that second loss came at the hands of a team that lost to Texas Tech, it’s nothing but good for the Big 12 and WVU. Arkansas hasn’t shown enough to instill confidence that they can pull off the upset in Tuscaloosa, but stranger things have happened. All you have to do is go back to 2007. WHY: College Gameday will be in town for this game and a Cal upset would shake some things up. Many on the national scene are still using Utah’s victory over Michigan as a selling point to their power. Losing to a Cal team that while undefeated now, will likely lose some games, will pull luster off the Michigan win. Utah has more speed bumps on the schedule and if they don’t trip up this week, the potential exists for later losses. WHY: The Sooners now have a game on WVU and will likely need to lose twice. Due to this, they will likely be weekly guests on this list. While a Texas victory seems highly unlikely, it IS a rivalry game. I know that I needn’t remind the Mountaineer fans what can happen in a rivalry game. WHY: This game just edged out Maryland at Ohio State to make this list. That is because Rutgers has the better shot at an upset. Rutgers hosts and Maryland plays on the road. Also, Maryland has the added distraction of the rumors that Saturday’s game might be Randy Edsall’s last as the head coach at Maryland. Despite their high rankings, neither Ohio State nor Michigan State has performed well enough to instill confidence in most that they are upper-echelon teams. A loss by the Spartans to a 2-2 Rutgers team could be the first in a line of dominoes to fall that could leave the Big Ten out of the college football playoff. Pull your seatbelts tight and enjoy Saturday’s games. If the season so far is any indication, it’s about to be another crazy weekend of college football. I’ve had discussions in the past where I’ve had to inform people that they aren’t college football fans. Just because you love your school doesn’t mean you love the game. If you only follow what WVU does without looking at the rest of the college football landscape, you’re only getting part of the big picture. The Mountaineers are 3-0 on the season and control their own destiny. If they win all of their games, they are all but assured a spot in the College Football Playoff. If WVU has a dream season and makes the playoff, it will likely have to be with one loss. High powered Big 12 offenses and the landscape of current college football hint that it will be difficult to make it through the rest of the schedule unscathed. Both the wins and losses in the record need to be as strong as possible. We need to look at other games across the country. There are things to watch for and certain outcomes that will benefit the ol’ gold and blue. None of this even matters if WVU fails to take care of business. Let’s believe that they will. WHY: TCU is coming off a near defeat last week at the hands of Texas Tech. They are ranked #4 nationally and WVU needs them to be undefeated when they visit Fort Worth on October 29. Texas was smoked 38-3 by Notre Dame in their season opener. At this point, it will benefit WVU fans if Texas is defeated handily by all quality opponents the rest of the season. It would be good for the conference for all contenders like TCU, to beat the Longhorns more convincingly that Notre Dame did. WHY: In modern college football, once you defeat an opponent you should begin pulling for them. If the Terps could pull off the upset of Michigan just a week after being annihilated 45-6 by WVU, perception of the Mountaineer victory will be much better. Michigan should end the season as a bowl team and there is a lot of talk (though I consider it foolish) of the Wolverines winning the Big Ten. It’s a long shot that Maryland can do it. However, the game time has been changed due to Hurricane Joaquin. Maryland showed no ability to pass the ball against the Mountaineers and it may not even be an option if the game is played in a monsoon. They were able to run on WVU and the weather could benefit the Terps, though it’s a long shot. WHY: After defeating Arkansas and giving TCU all they can handle in back-to-back weeks, the Red Raiders have made a name for themselves on the national scene. However, they do have a loss already. It’s best for the conference (and WVU) if Tech plays with Baylor. The Bears could walk away with a close victory, make the Raiders look good and still not lose prestige. At the end of the day, defense in the Big 12 is a joke nationwide anyway. Baylor could actually receive help from a close game. Their schedule so far on the season leaves a lot to be desired and they haven’t even left the state of Texas. WHY: Georgia Tech was a trendy pick to win the ACC this season. They’ve stumbled out of the gate, losing games to Notre Dame and Duke in the last two weeks. The ACC may be the weakest of the Power Five conferences, but it will help the Big 12 significantly if the teams cannibalize themselves. Georgia Tech still has Clemson and Florida State on the schedule, so a third loss followed by beating the Tigers and Seminoles is a good thing. Many Mountaineer fans are still bitter that Ryan Switzer plays at UNC, but put that aside for the weekend and be a Tar Heels fan. WHY: Until they join a conference, any time that Notre Dame has a good season, the Power 5 conferences have to be concerned. If they make it into the playoff, at least two conferences end up without a representative. The Irish receive every benefit of the doubt in the polls and in the media. It’s no stretch to believe that the playoff selection committee will do the same thing. Just two seasons ago, they were in the National Championship game simply because they were undefeated. There were better teams with losses, but the Irish played for the title and were annihilated by Alabama. Hopefully the only one in the stadium “Clemsoning” on Saturday night is the Irish. However, there are still possible losses on both teams’ schedules. There’s still a lot of football to be played and none of us know what is going to happen. This is just how I see it at this moment in time. Dear Big 12, can you do me this one favor? It was once sung that video killed the radio star. It was not an Orwellian statement, but there was certainly some truth to it. Radio has not gone away, however. MTV has gone away from music videos and would rather keep up with the Kardashians or have show us what the real world is like in a fake setting. ESPN has gone from informative to laughable. Radio has adapted in the last generation and with internet radio, satellite radio, podcasts, apps and more and is still viable. Most weekdays from 7am until 430pm or so, I am listening to radio. It may not be non-stop but I am listening. It through the methods above that I listen – via Sirius/XM on the way to and from work and via radio station apps and podcasts while I am at work. I know that not everyone is like me. However, many are. I will admit I am a radio homer. There are times that my mind brings back childhood memories and a lot of them are of fall Saturdays listening to Jack Fleming and Woody O’Hara call Mountaineer football games. In my teens I began listening to Pat Foley and Dale Tallon not only call the current Chicago Blackhawks game, but also teach me about the game of hockey. I also fondly remember the voices of Hank Stram, Myron Cope and Brad Sham calling NFL games. These men were major factors in me wanting to go into sports radio. Things did not work out that way. I have a degree in Journalism from West Virginia University and went through the TV and radio broadcasting sequence. I worked on the sports staff at U-92, the student radio station. It was working on that staff that I realized sports radio was not the career for me. I did not love sports the way the other guys did. They would stay up until the last west coast game was over just to see what happened. It did not matter what the sport was. I did not and still do not have that love. I was well into my junior year when I discovered that radio was not what I wanted to do. However, I went ahead and finished out my degree. Fast forward to the present and I work an office job for a fantastic company. My career has me doing something that I enjoy and that suits my talents. I have no complaints. I do get to listen to radio (much of it sports radio) while I’m working. All of that brings me to this point. The Big 12 Conference should “think outside the box” some and start their own radio network. For whatever reason, there is not a Big 12 television network. The “why” does not matter, it simply is a fact. I will not give the conference too much hassle for this since it appears political. There is no conference championship game. I understand why. I know the current rules. The conference failed to name “one true champion” after the 2014 football season, which likely kept the conference out of the initial College Football Playoff. The conference’s “Big 12 Insider” Wendell Barnhouse does not even have a Twitter account. When you start adding together the pieces, it makes the conference appear out of touch. Less than a year ago I moved to Arlington (Texas). The Big 12 is run from Dallas. Any time that I turn to one of the local sports radio stations, they are talking Cowboys, Rangers or Mavericks. There is little mention of Texas, TCU or any other college program. I understand that this is a pro-centric area. All major cities are. However, walking through the parking garage for my office, you can find stickers or license plates representing almost every Big 12 school. There are millions of people in this area alone and there is certainly a college sports fan base that is not being catered to. In smaller areas where most of the schools are based (like Morgantown or Waco), how is the local school represented on radio? There are options to hear college football talk on the radio. I listen to WJOX, based out of Birmingham, because I can get 90% college football talk. It is catering to an SEC audience though. Sirius/XM has a station devoted to college sports. However, the SEC is the dominant conference in college football right now and is more likely to have their fans listening than other conferences. While they touch on all schools and conferences, it is limited in the amount of time it can dedicate to the Big 12. Not everyone that is an alum or fan of a Big 12 school has an office job and can listen to radio at work. In the last two years, I’ve worked in three different companies’ corporate offices and typically you do not walk more than a few yards without seeing someone with earbuds in or headphones on, listening to something. From West Virginia coal miners to Texas and Oklahoma roughnecks, there are plenty of folks that won’t have that ability, but there are plenty that would. I’m not suggesting that the conference should attempt to get onto Sirius/XM. However, you could make it stream from the website and an app. If radio stations in the sticks can make that happen, then the deep pockets of the Big 12 can allow for this. The conference covers a lot of country, but only has schools in two time zones. Morning and afternoon talk time wouldn’t be too far off. You can have those issues with national programs. Think about ESPN’s “Mike and Mike.” The start time in Los Angeles is when some night owls may just be headed to bed. That would not be an issue inside the actual school footprint of the conference. In general, sports radio personalities have multiple jobs. Off the top of my head, I can think of ones that work on TV as well, as PA announcers, as play-by-play or color commentary announcers and some even have additional radio shows. For most, it is not a full-time job. It’s feasible to have personalities on-air less. It makes a need for more personalities with opinions and insights. This is critical to keeping sports radio from getting stale. Why not have a few hours a day of “general” sport talk and then have some that is more school specific? Perhaps have someone well respected in each school’s area take on a show for a few hours a week. Why not have a Paul Finebaum type for the Big 12. I will not throw names out there, but there are plenty of people across the conference footprint that could provide quality content if they wanted to. I can think of more than a few in West Virginia alone. There are people that I follow on Twitter that hold other jobs in sports and/or have their own podcasts that would be solid, informative and entertaining personalities. Why not the BGS radio show that will be starting soon? I do not have all of the answers and do not claim to. I do not have a business plan. I know that it’s not just something that you can put together in a couple of months. However, it would be something that could benefit the conference in many ways. It can bring conference-centric content to the fans. A Finebaum type show could get fans fired up. It shows how passionate many fans are and could help create rivalries. At this time, West Virginia does not have a rival at all. There are many more benefits that even if not at face value are monetary, could result in financial gain on the back end. But this is just one guy’s thoughts. You can follow me on Twitter at @kin_kinsley. I tweet all my interests, including WVU football, from that account. This was originally posted on bluegoldsports.com on July 27, 2015. You can find the piece here. They aren’t fun to watch like Earl Dibbles Jr’s “Dip “Em and Pick ‘Em,” but below are my picks from this week for the BGS Pick ‘Em contest, plus all Big 12 and Top 25 games. Nebraska at Michigan State – In a preview of the likely Big 10 Championship game, I take Sparty at home. Utah at UCLA – UCLA…but a Utah win wouldn’t surprise me. The Bruins have been rather underwhelming this season. I am going to try to start doing this weekly, but we will see what time permits. Only went against College Football Matrix on a few of these. You can see their picks here. I have great respect for what Dave Bartoo does. TCU at SMU – TCU is going to continue SMUs misery. It’s not pretty in Dallas these days. Texas at Kansas – Texas, though I admit I wouldn’t be shocked to see the Jayhawks but an upset. Texas hasn’t really gotten roliing on offense yet. Baylor at Iowa State – Baylor. I know Iowa State played K-State tough, but this isn’t K-State. I would be surprised if the Cyclones score 14. Texas Tech returns to the field following a bye week and a loss to Arkansas. The Raiders are scoring 33 points a game, but giving up almost 37. Davis Webb is second in the conference with 327 passing yards a game and leads with ten touchdown passes. Tech rushes for 170 per game, and both DeAndre Washington and Justin Stockton both average over 60 rushing yards a game. Brad Marquez is tied for second in the conference with five touchdowns (all receiving) and Jakeem Grant is third with 6.7 catches per game. The Raider defense is struggling, giving up 297 yards a game. They gave up 438 yards and seven touchdowns on the ground. The pass defense gives up just 135 yards a game, but teams have not needed to throw much. Daxx Garman starts his second game for the Cowboys and they did not miss a beat in his first start, scoring 43 points. The trio of Tyreek Hill, Rennie Childs and Desmond Roland all have rushed for at least 120 yards on the season and have scored a total of five touchdowns. Hill also leads the team with nine receptions but is a possession receiver. Three other receivers have at least 150 yards and one touchdown on the season. On Sundays, some people probably need a morning after pill. I am more into the morning after poll. My top 25 is based on the season. Who do I think is the best right now (not where do I think they will end up)? What have you done? To Schedule Up or Down?